I’d like to thank LAEastside.com for allowing me to be their first “guest” poster, since as a Veggie-American I didn’t want to write this under my own name; my lapse in personal ethics weighs on me enough without the added glares and grumbles from my compatriots. But let me introduce you to the Big Blue Truck that tends to be the cause of this occasional failure in judgment; say hello to El Mar Azul! No doubt most people in Northeast LA have seen this blue truck that usually parks by Sycamore Park on Figueroa, it’s pretty hard to miss. Due to its popularity a few other trucks have started parking nearby, but the crowds still wait for this one. If you happen to see a small crowd like this waiting to order make sure you stop and join, as the line can get really, really long. The man with the magic touch. Once you place your order for the $5 Coctel de Camaron, make sure to watch how he puts it all together: he gets into a groove and kinda dances through every step of the process. Of course, you need to order it con todo, including the chile. 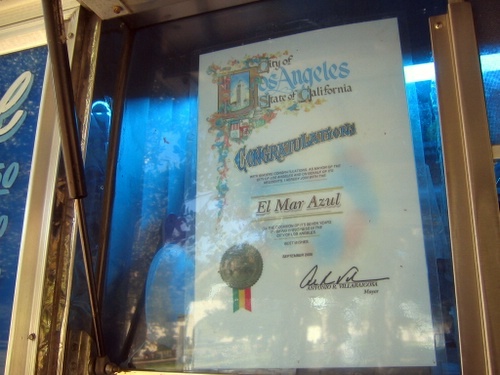 Looky here, a signed certificate congratulating this truck for its service to the community. And to think, someone can now enforce the anti-taco truck law and this place would quickly be out of business. 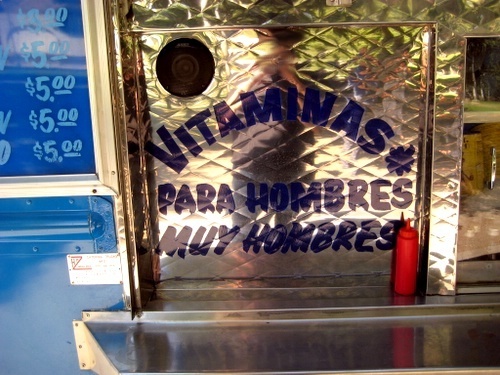 “Vitaminas para hombres, muy hombres.” That persistent myth will never die. Oh boy. 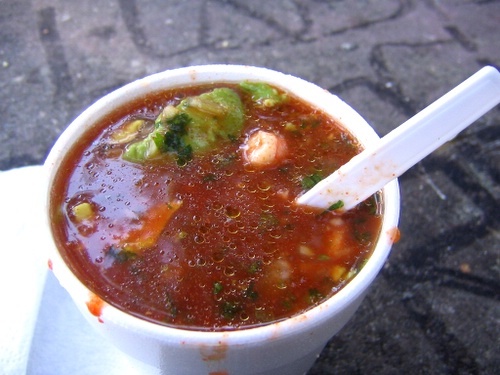 The mixture of tomato juice, limes, cilantro, cebolla, avocado chunks, and a good shot of hot chile sauce makes this concoction a tempting midday meal. They serve cocteles, tostadas and nothing else. They claim they have the best coctel in all of Los Angeles; I believe them. 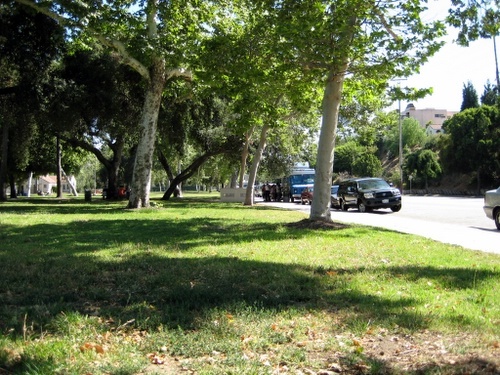 And you get to sit at a nice park while you enjoy your meal! What else do you have to do this weekend? This entry was posted in Food, Greater Los Angeles by Eastside Guest. Bookmark the permalink. I’m not a big seafood guy but this definitely looks amazing. I might go out to Highland Park to have it. On another note, I want to figure out who you are… I have my suspicions. Then again, L.A. has a massive population. Sounds wonderful! I shall definitely try it. Thanks! the best ? oh man, I gotta try this! I just hope it doesn’t come with pulpo, I hate that. hahaha, my boyfriend’s family owns that truck. 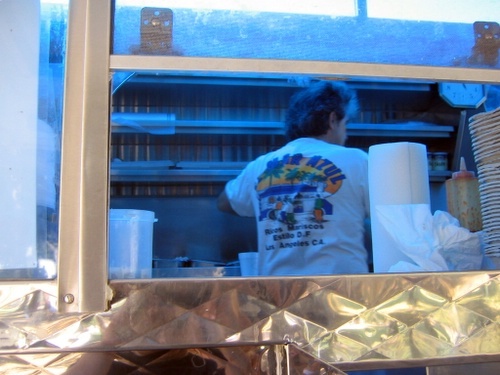 that’shis father in the picture and his mother is the blonde woman behinde the counter.their food is delicious, fresh and i can attest that is is VERY clean because i’ve spent a few hours hanging out and eating inside the truck when visiting the bf while he’s helping out. 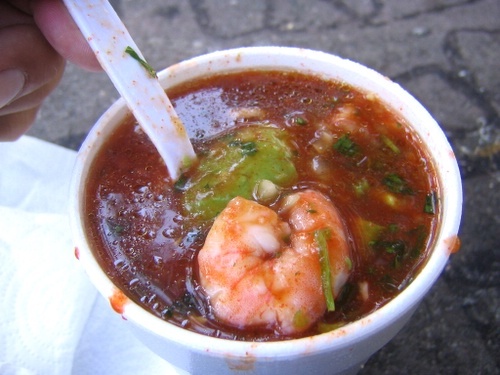 mariscos cocteles have gotten me through many a hangover. 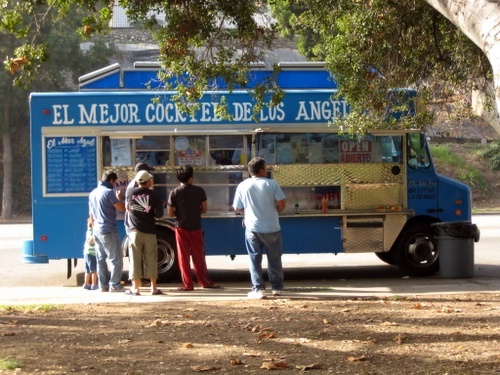 i’ll usually hit up the linda’s troka by olympic/8th in bh… have me a campechana mediana (with plenty o’ tapatio) and a taco dorado de camaron. and how can anyone hate on pulpo… with all that chewy tentacley goodness! I know who you are!!! We could see your reflection as you were taking the photo the “Vitaminas” sign. BUSTED- I’m going to tell ALL THE OTHER VEGETARIANS!!!!! …no tortas de camaron? Eh? yup they do tostatdos as well!! I have been going the blue truck for at least 5 years. I have driven from far places to have it. I have gone a few times lately, but the truck has not been there (and I know Tuesday is the trucks day off). Hope he is okay. Please let me know if he is there for I can’t wait to eat the best food in the world. Does anyone know if the shrimp are deveined? Cleaned of that black line (intestinal tract) that runs along the back of the shrimp? Good question Chicho… especially if they serve jumbo shrimp. There’s another spot here on Olympic just a couple of blocks east of Wyvernwood and I have seen huge crowds. Does anyone have any reviews or opinions? Do you know if they devein the shrimp? Does anyone know what time they show up there on week days? I know that they are closed on Tuesdays, but I am not sure what time they get there. Yeah this place is great and economic. Whenever we drive down from Oregon we stop and get lunch.